There is so much hype about hydrofoils but I never had a chance to actually try it. I have Takuma Concept foil and attached it to the regular rigid surfboard and inflatable SUP using Foilmount. However the area where I live does not have the conditions for foiling and I needed a calm lake with a towing boat crew to help me learn it. Finally today I got a chance to try this hydrofoil thing with a towing crew on a lake! Unfortunately none of the crew ever tried or ever seen a hydrofoil, so there was no “expert teacher” to guide me and we had to learn it as we go. It took 3 hours and it was one of the most frustrating and humiliating experiences. I’ve never experienced anything that hard despite some good knowledge in wake boarding and wake surfing, this is a completely different beast. First I tried the inflatable SUP with foil attached to it. I expected that being a big and stable it will be much easier for me to learn starting from the standing position. It was complete mayhem. The board was wobbling, flying nose up completely out of control. That was so frustrating and impossible to control it. Next we attached the foil to the rigid and smaller 8 feet surfboard. I started trying to foil laying on it on the belly or staying on the knees but it was impossible to balance. Once the foil lift up, I lost all the control. The only solution was to balance by standing up on the feet but this alone was very hard task to accomplish, as with foil attached the board is always in horizontal position so you cant quickly start it like a wake board from the water with both legs on it. You have to be pulled by one arm and somehow after getting speed put front leg in front, then back leg and try to stand up. That was insanely hard for me . The hydrofoil creates huge drag when not foiling and you are pulled by one arm instead of two like in wakeboard, trying to hold the board with other hand and standing up at the same time. Really a nightmare experience and required balancing skills that I never saw in my life. After I finally managed to stand up (pulled by one arm), the boat was ready to increase the speed to 9.5miles/hour, which for me was minimum speed to lift up. After the board lifts up you can forget everything you know from regular surfing, jetboarding, wakesurfing etc as it’s a completely different 3 dimension balancing act which by itself is very hard and dangerous.Nose is flying up, you fall down in an awkward position and the board with a sharp foil flips over in the sky and falls on top of you. I could get some cuts and bruises easily if I did not use the wetsuite, booties and helmet even though it was not cold. I highly recommend full protection when you learn it, the foil is very fast and very sharp on such speeds. Anyhow, after 3 hours of constant wipe outs and humiliation I could figure out what to do to be able to “fly” at least 10-15 seconds without falling. It was pretty cool unusual feeling soaring above the water standing on a board that does not touch the surface. This however is very hard to maintain, that’s why most hydrofoil videos always last no longer than 20-30 seconds on each shot, then the person usually falls even if he is a professional I hope electric hydrofoils solve the issue of standing up, as for me the hardest part was that the energy was coming from top of my body pulled by one arm instead of the foil itself. 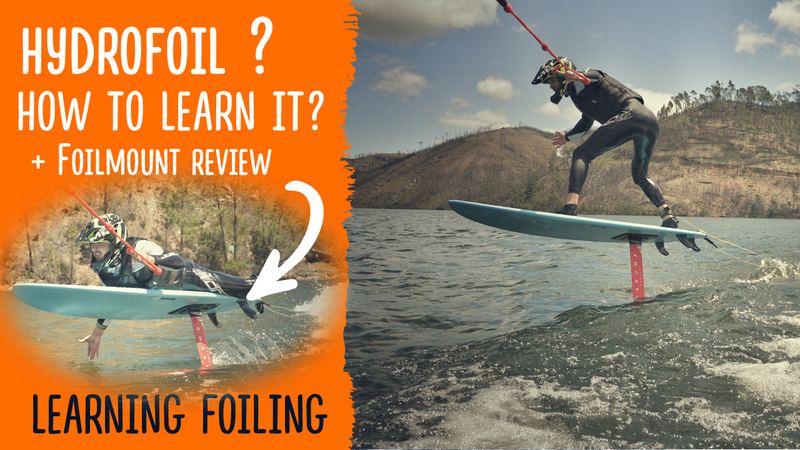 It was fun to do it but I strongly recommend to get an experienced teacher if you want to learn foil and not try this at home alone.